In line with its 6th anniversary celebration, LRI Design Plaza proudly presents “CONNECTING WITH GREATNESS” – an exhibit that will showcase a collection of table-top sculptures and a few functional art pieces by artist Ferdinand R. Cacnio. The invitational opening exhibit is set on March 11, 2010 at 6:30 p.m.
LRI Design Plaza has become the design hub for upcoming and established designers and artists, with over 30 showrooms/galleries featuring world-class furniture, furnishings and artworks. Over the years, LRI Design Plaza has been actively supporting the promotion of design and arts. Thus, annually during its anniversary celebration, it launches an event featuring homegrown designers and artists. 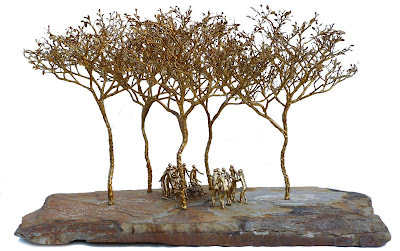 And this time, it presents a one-man exhibit by respected sculptor Ferdinand Cacnio as it believes in the artist’s talent and admires his excellent creations. 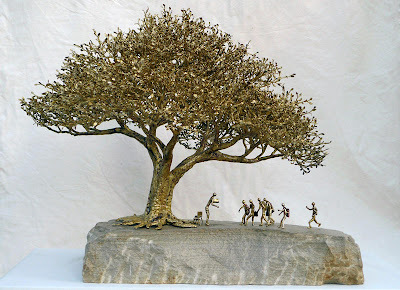 “CONNECTING WITH GREATNESS” is an all new series wherein artist Ferdinand Cacnio came up with a lot of small human figures and surrounded them with tall graceful trees. Ferdinand has been applying his style of composition inspired by the fluid lines of dance on subjects other than dance. He has done this with his sculptures of fishing villages in a previous exhibit. This time around, he applied it on trees. He has always had a fascination for trees. “They dance with the wind; they change with the seasons; they make me feel alive and safe.” He played around with the leaves, branches, tree trunks and even the roots, infusing them with strength, fluidity and grace. And then he conveyed his message of the need to connect / reconnect with Greatness by adding a lot of small human figures. His delivery of this message is ever so subtle, with a play of bigness and smallness, but a viewer would know that the artist’s understanding of Greatness is that which comes from the Almighty. 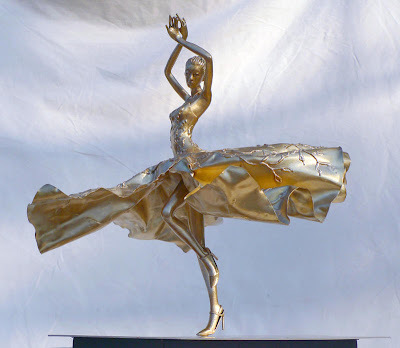 In a separate exhibit area, LRI Design Plaza and the Galerie Astra decided to display a few dancer sculptures. In keeping with the nature theme of the exhibit, Ferdinand introduced a new element in his flamenco dancers – their long flowing skirts appear to be embroidered. Upon close scrutiny, it is evident that the artist derived inspiration from foliage. Ferdinand R. Cacnio is, in essence, a visual artist. He finished his studies at the University of the Philippines, Diliman with degrees in B.S. Psychology and B.S. Civil Engineering. Although he had no formal training in the arts, he has been nurtured in the aesthetics of fine arts since childhood with the mentoring of his artist-father and members of the Philippine art world. This led him first to a fruitful 20-year career in graphic design as Creative Director of his Atelier Cacnio. 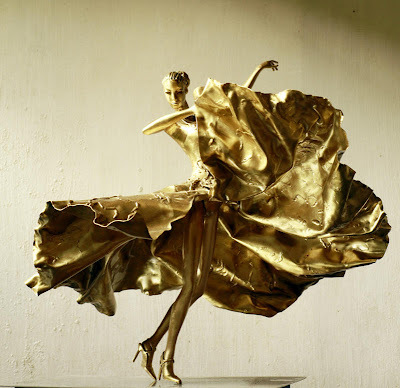 In 2005, Ferdinand's career as a sculptor started with a successful solo sculpture exhibit "The Dancer." In that same year, he bagged an award from the Art Association of the Philippines. His passion has produced a public art in Bonifacio Global City, seven solo exhibits, participation in a number of group shows and art auctions that have caught the attention of art collectors and the elusive approval of well-respected art critics. His recent solo exhibit “Sapatusin” (October 2009) received the critical nod of Dr. Alice Guillermo. Ferdinand is a member of numerous art groups in the Philippines: Tuesday Group of Artists, Art Association of the Philippines (AAP), Sining Tambobong and Society of Philippine Sculptors (SPS). “Connecting with Greatness” will be on view until March 27, 2010. Open from Monday – Saturday from 10 am–7 pm. LRI Design Plaza is located at 210 Nicanor Garcia St. (formerly Reposo St.), Bel-Air II, Makati City. For further inquiries, please call tel. nos. (632) 895-1772; (632) 895-7949.